The Dodgers finished the month of August 16-13. On August 1st they were 2.5 games up on San Francisco. They close out the month in the same spot, 2.5 games up. They went through seven starting pitchers in the month and eleven different relief pitchers. Such newcombers as Darwin Barney, Ronerto Hernandez, Kevin Correia, Pedro Baez and Carlos Frias made significant (and insignificant) contributions. Others such as Josh Beckett, Jose Dominguez, Chris Perez, Paul Maholm, and Stephen Fife were lost for the year. 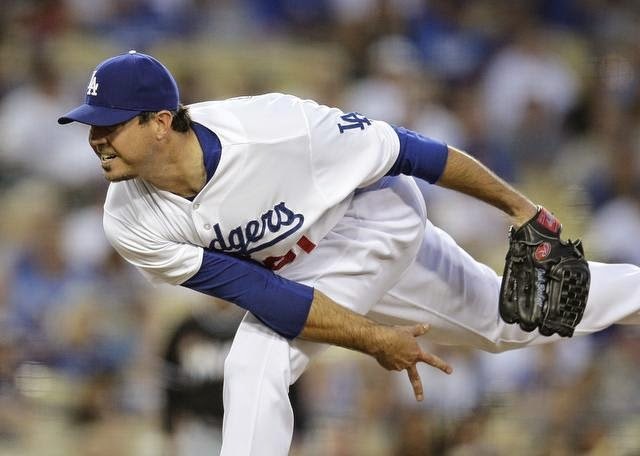 There were scares with injuries hobbling Juan Uribe, Hanley Ramirez, Hyun-Jin Ryu and Zack Greinke. But here we are, after all that, the Dodgers still remain in a relatively strong position. There are 25 games remaining, and the Dodgers destiny is on their hands. It's not as if the Dodgers are looking for help or anything, but don't you find it particularly annoying that the Milwaukee Brewer went into Los Angeles and played the Dodgers like World Series champions and swept them, only to go into San Francisco this weekend and roll over and die? The Brewers are quickly becoming my latest team to despise. Not only for the reasons mentioned above, but also because of that left fielder of theirs, a player that lacks character more than any other player in the league. Mr. Ryan Braun. (Something addressed in previous posts several times over the years). But back to Milwaukee the team. I honestly hope they don't make the playoffs, just because they have done everything in their power to keep the Dodgers out of post season play. That and the gimmicky slide, stupid sausage races and for being the team of Commissioner Bud Selig. I find it hard to believe that there is actually a statue erected to the man outside that stadium of theirs. So in the period of six days, the Dodger lead disintegrated by more than half, from 5.5 to 2.5. Those things happen in the course of pennant races, just as the Giants 9.5 lead disappeared quickly in May. It should be noted that though the Giants had a great week, going 6-1, their elimination number reduced from 29 to 24, at a pace of almost one game per day as well. You didn't think it was going to be easy did you? Especially after 3/5 of the Dodgers starting staff disappeared with injury and it got to be Kershaw and then count the days until Kershaw would pitch again. The truth of the matter is that if Greinke and Ryu don't return to form, this team will be in trouble in post season play, (and getting there). Those three are enough to carry the ball club to the World Series, but they have to stay healthy. Signs have shown that not to be the case during most of the month of August, but after Greinke's last two starts and Ryu's return today, maybe they will hold up. Now the Giants. They're good. No doubt about it. Their pitching is solid. Their hitting mediocre, but streaky at times. That Giants starting five made up of Bumgarner, Hudson, Vogelsong, Petit (& no Lincecum) and Peavy is not a bad staff. As a Dodger fan, you don't want them inching much closer to the lead because those horses can hold up down the stretch. Those five guys will keep their team in contention most nights. Believe it or not, these three upcoming against 1st place Washington are big, very big. It'll be a tough chore, but champions have to win during these stretches, and this is their test. 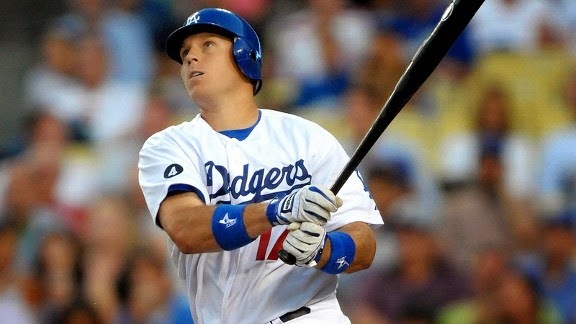 Do the Dodgers have the heart of a champion to take the reigns of this race and hold on strong? Guys are hobbling, some are slumping and the rotation has resorted to depending on guys like Roberto Hernandez and Dan Haren fairly often. But this is it. The time for the Dodgers to show that they are that club that can go all the way. A sweep of Washington would do wonders for their confidence. First, because these would be wins at home, (something that they inexplicably haven't done well at all this year) and second, because the Giants are playing well and making a run at them, and third, it will show the baseball world who will be the team to reckon with in post-season play. Over the years the Dodgers have had their share of slow base runners. James Loney comes to mind. So does current first baseman Adrian Gonzalez. But I think I speak for EVERYBODY when I say that A.J. Ellis has got to be the slowest position player base runner they have ever had. And he probably wouldn't argue about it either. I love they guy, but man! Talk about running with a piano on his back. 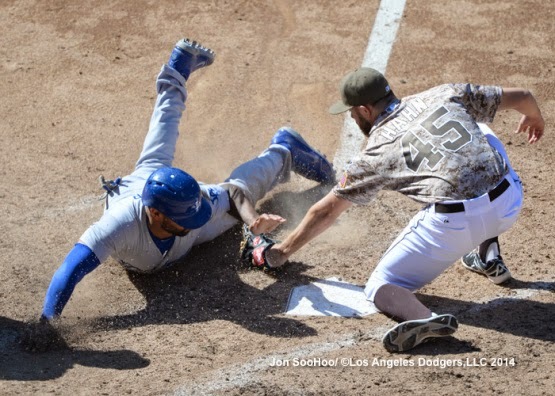 Matt Kemp's avoidance to the tag while scoring the Dodgers sixth run today was about as savvy a base running play I've ever seen him make. Kemp has a history of base running blunders, especially from his earlier years, but that was simply a veteran player knowing where he was and avoiding the tag as on a true "Dodger" can as he literally lived up to the team moniker. Great heady play! It's always nice to win on "get-away" day. Today's win was a big one. Had San Diego swept them, it could have really set the Dodgers off in a tail-spin. It's a 30 Game Season and the "Good" Far Outweighs the "Bad"
There is a 30 game season remaining and the Dodgers have a 4 1/2 game lead. This thing isn't over by any means but I like their chances. Look at it like a 30 mile road race and the Dodgers have a 4 1/2 mile head start, and then they get to add new horses to the team at the Sept.1 roster expansion date, and maybe another starter before the final trade deadline. The Dodger schedule is against teams with a combined winning percentage of .473. Take out the three games against Washington and their combined percentage is .421. Clayton Kershaw will start six more games, and if things continue as they have, there's a pretty good chance that he'll win them all. Hitters such as Adrian Gonzalez and Matt Kemp have been heating up, leading the club to several victories during the pennant race stretch. They may be peaking at the right time. Players that will be vital to the club in the final month are returning from injuries. 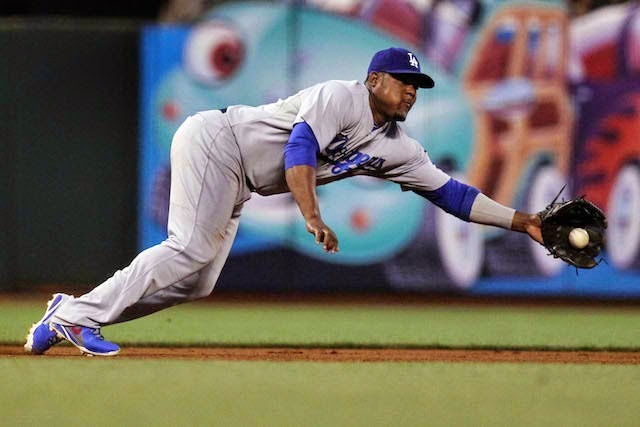 Those include Hanley Ramirez, Hyun-Jin Ryu and Juan Uribe. 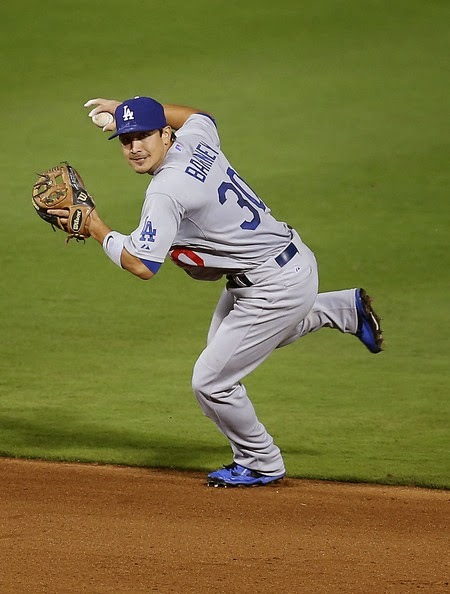 With the roster expansion, additions such as Joc Pederson and additional infielders Arruebarrena and Guerrero will provide an additional push that might be worth game or two. Dee Gordon has been stellar and Yasiel Puig is due for another streaking set of games. Those two alone are responsible for setting the table and have done so all season long. Both will make a few significant contributions in the latter weeks of the season. Their catching duo of AJ Ellis and Drew Butera are each hitting under .190. There's no relief in sight from Triple A, though Tim Federowicz should be called up in September to provide some assistance. A starting staff that is struggling to make it to the finish line in a healthy state. Greinke has had some elbow issues, Ryu a strained buttocks muscle that landed him on the D.L., Beckett out for the year with a myriad of ailments, and that leaves you with newcomers Hernandez and Correia, the latter really failing to impress. Add to that Dan Haren, who has had his share of struggles and then starting ace Kershaw. The starting staff has question marks all over the place and the Kershaw, Greinke, Ryu, Beckett foursome that was such a strong quartet a few months ago is now down to one sure thing (Kershaw) and four concerns. The bullpen has had some inconsistencies that include League, Wilson, and Wright. They aren't terrible, but they can't be counted on consistently. Hopefully Paco Rodriguez is able to return before season's end to provide an additional left handed arm. The loss of Chris Withrow to TJ surgery was quite a blow. Jansen and JP have been awesome. The Dodger home record continues to not impress, (it's 34-32). This is one of the strangest seasons on record. For that reason, I really don't see the importance of the Dodgers achieving home field advantage in the post season, but a good run in these final 30 might clinch home field advantage throughout it. They're actually a better team on the road. 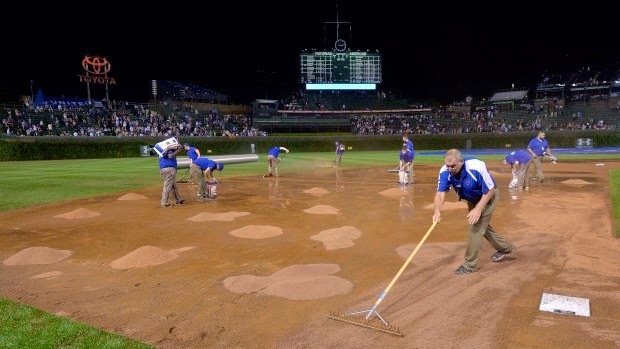 During a fifteen minute rain shower at Wrigley Field last night, the Chicago Cubs grounds crew botched the placement of their tarpaulin so badly that they single-handidely gave the Giants a loss in the standings. The Giants are angry. The result was a 2-0 four and a half inning loss for them and a full game in the standings. Perhaps this puts an end to their momentum swing in the past few days. San Francisco is protesting the entire situation with MLB, but they have no recourse. It is what it is. The game was barely an official game, but an official one nonetheless. There are no provisions in the MLB rulebook that would allow the game to be played the following day. You can't change the rules mid-stream. The Giants will have to accept their plight, whether you consider it fair or not. Truth is, they got gypped. This was was an unforeseen and sudden downpour from the blue heavens that drenched the field. 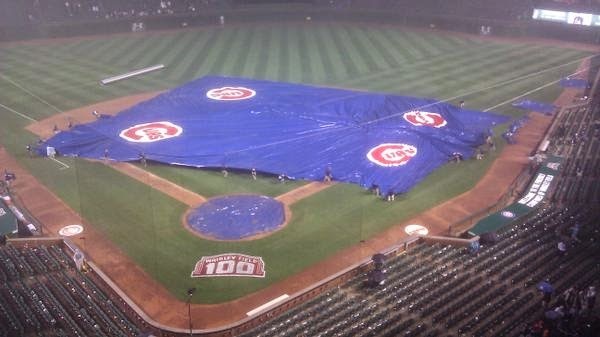 So sudden that the grounds crew was ill prepared to get the tarp out properly. So much water fell, that the tarp became too heavy to move after it obviously needed to be maneuvered to cover the whole infield. It was almost as if divine intervention handed the Giants a loss. Attempting to pull the tarp over to cover the whole infield was an exercise in futility. I was weighted down with to much water. These are the occurrences during the course of a season that point towards trends that produce the ultimate outcome. Which is better said as "SOMETIMES YOU JUST GET LUCKY." You can't tell me that the '88 Dodgers weren't lucky. It happened a lot of times. It all started with the collusion ruling that allowed the Dodgers to land Kirk Gibson. Then they were lucky that Jesse Orosco pulled that prank in Spring Training to change the tone of the team that year. They were lucky throughout the season a bunch of times. Heck, they were even lucky that the players all bought Bruce Springsteen tickets, so they vetoed having to play a game in S.F. on a replacement day, because they wanted to see the Boss instead of play the game, ( resulting in a doubleheader that they swept...changing the course of the season). I'm getting off topic here...so let me reel this back in. My point is that in seasons of destiny, luck comes your way more times than not. I'm not taking anything away from the successes of the San Francisco franchise. They won fair and square, but you can't tell me that the Giants weren't lucky in both those championship seasons in 2010 and 2012. They didn't draw superior opponents in the World Series like strong Yankees or Red Sox teams. They had runs that kept their teams healthy that were uncanny. The saying that "it's better to be lucky than good" is very, very true. So chalk up August 19, 2014 as a key date in the season. The Gnats got the shaft. The struggling and injured Dodgers gained a game and the season moved a date closer to its end. All that stuff that Lasorda preached about the "Big Dodger in the Sky" hasn't played out for a lot of years, but maybe things are changing. Remember this date in late September, that one game could be very significant. With Rob Manfred now unanimously voted in as the next MLB Commissioner, Bud Selig has completed what is most likely his final significant act as the leader of the game. I've got to hand it to him, he was able to unify 30 divided owners through a few hours of negotiations and get them to all approve of his man. That takes negotiation skills. That takes some persuasion. 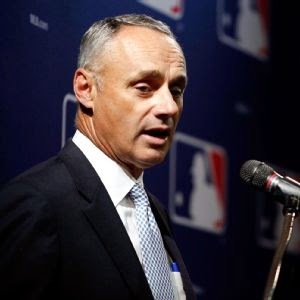 Going in, it looked like the baseball owners summit in Baltimore would be contentious as several such owners such as Arte Moreno, Jerry Reinsdorf and John Henry had already voiced their preference of Tom Werner over Selig's man, Manfred. Reports going in didn't look promising for the departing Commissioner's preference but Selig worked his persuasive magic as the white smoke emerged from the chimney of the Baltimore Hyatt Hotel after the third vote. 30-0 was the tally as MLB's papacy was announced. Manfred has been known as a keen negotiator and labeled as the man responsible for maintaining twenty years of labor peace in the game. For that he's to be commended, but MLB is facing some upcoming obstacles, with first and foremost the collective bargaining agreement that will sunset in 2016. The All Star game home field advantage idiocy was a Selig invention. So was Inter-League play-ruining decades of baseball tradition. The ruination of sacred baseball records tarnished by steroids happened on his watch and the informal clash with Peter O'Malley that influenced his departure from the game occurred too. 1) Stop the All Star game "home field advantage" nonsense. It is ridiculous to have an exhibition game determine the HFA for the pinnacle of the sport. 2) Announce that Shoeless Joe Jackson has been pardoned by MLB. The evidence is there. The punishment was too severe. On the same vein, Pete Rose should not be forgiven. He lied for too long and he never fully came clean. The Rose story is a sad one, but should serve for years as a lesson that great players/managers can't cross that line and engage in activity that will destroy the game. 3) Propose even stronger sanctions for performance enhancing drug violations. The system in place still doesn't levy penalties strong enough to keep players from testing their luck that they'll slip past the testing process. The massive contracts are too much incentive for players to try to cheat. A first time violation should be a one year sanction. A second time and you're banned for life. That would stop the players like Ryan Braun, Alex Rodriguez, Manny Ramirez, Melky Cabrera, and others from attempting to cheat. 4) Negotiate a certain percentage of the TV revenues, maybe as low as less than 1% to be donated towards the Baseball Assistance Team (BAT) to help retired players that are in need of medical care or assistance. A few million dollars would go a long way here and do a lot of good. 5) Do something about the deplorable financial compensation of minor league players. Arrange for per-diems to be tripled and ensure that no minor league player is living on peanut butter and jelly sandwiches and sleeping on host family couches. This is a dark spot on the game that could easily be remedied by distributing some of the game's wealth into the lower trenches and development areas of the sport. Some of those kids are making less than minimum wage when you factor in the amount of hours worked and the low level contracts that they signed. 6) Enforce the "pitch-every 20 seconds" rule. The game needs to be sped up and by enforcing this rule, you'll see a significant change in the pace of the game. Additionally some changes could be introduced that limit the amount of pitcher-catcher mound visits. These two moves alone would speed up the game substantially. 7) Endorse the World Baseball Classic for the month of November, after the World Series. There are enough warm weather countries that can host the game in the late Fall each year and warm weather U.S. Cities that can host as well. Breaking up Spring Training has resulted in an awkward event with players getting injured in their rush to be ready by mid-March. The WBC has been more of a distraction than anything else. A November tournament will have players that are in baseball shape, and if they are injured int eh tournament, they'll have time to recover for the coming season. 8) Tell the Giants to take a hike with regard to their territorial rights over San Jose and permit the A's to move there. This is one of Selig's dumber non-moves as the the A's should have been allowed to move years ago. The Oakland Coliseum is a dump and the fan base is in need of revitalization. Some Silicon Valley investment and a modern stadium in that sunny region will be a very positive move for baseball. Give the Giants a draft pick in exchange and move on. 9) Change the rules with regard to Cuban exiles that escape the island to play major league baseball. Allow them to come directly to the U.S. and apply for open bidding into the game. The system in place has created an underground human trafficking operation that is rampant with criminal figures, risking lives and forcing extortion and kidnapping in seedy third world countries. Those moves would be a start. Feel free to add a few if you are so inclined. If this was Christmas time, I'd say there would be no better candidate to play the role of Ebenezer Scrooge than Joe Torre. What's with that guy? I've never hidden my disdain for his mountain size ego along with his poor on-field managerial skills, but now that he works for MLB he wants to ban the Dodger bubble machine? Are you kidding me? Aren't there bigger fish to fry for Mr. "I Never Met A Camera that I wouldn't pose for" Torre? If you haven't heard, MLB is being mum about the news that they ordered the Dodgers to nix the bubble machine. The team complied for Tuesday's game. On Wednesday, the bubble machine was was back in action at Anaheim. We aren't sure if MLB backed off on their edict or if the Dodgers are defying it and letting their actions tell them they can stick it. How harmless is a bubble machine in the dugout? It's silly, sure. But that's what makes it appealing. Grown men acting like little boys. Kids love it, adults love it. The boys of summer dance in celebration over it. What damage is being done? Absolutely none. So here's my idea. What we as fan have to do is create a massive bubbling protest against MLB. For the next Dodger game, all fans need to bring their own bubble making apparatus. Nothing fancy. The plastic ring thing with the blow through tube. 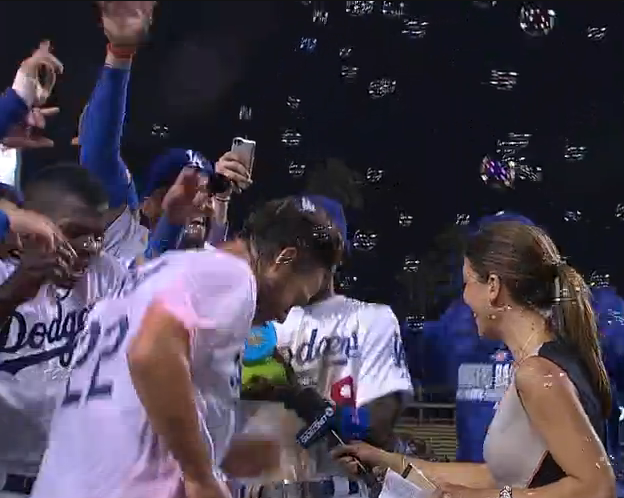 When the Dodgers score a run, Dodger Stadium can turn into a giant bubble making magical paradise. If MLB won't allow it in the dugout, we can all stick it to party pooper Torre. Try stopping 50,000 plus bubble blowing fans Joe. Do it folks. Let's blow Joe away. Alright Dodger fans. It's time to invade Angel Stadium. Time to show some creativity while rooting for our Dodgers. The hour has arrived to show the Anaheim faithful who truthfully hate being identified as being the "Los Angeles Angels of Anaheim" that we completely agree with them. How's this for a chant? "BEAT 26.1 miles southeast of L.A.!! Beat 26.1 miles southeast of L.A.!!!" Has a ring to it, doesn't it? Yeah I know, that's a mouthful. How about this? "BEAT L.A.!! of Anaheim, Beat L.A.!! of Anaheim." Maybe it's best to simply chant "Let's Go Dodgers!" After all, we've never really had to resort to emphasizing the enemy in our chants. Mentioning the opposition in them is a sign of an inferiority complex, isn't that right San Francisco? When the Dodgers have players like Seager and Urias making the all star team in five years, we can take solace in the fact that the Angels will still be paying a 39 year old Pujols $28 million a year and they'll still have another 2 years and $60 million to pay on the contract. Of course, by then the Angels might actually be playing in the city of Los Angeles if Arte Moreno gets his way. And Anaheim could possibly be a distant memory of the Halos. The Angels have an out clause on their Angel Stadium lease after the 2016 season and if Moreno doesn't get his way he has already made noise about moving to other Orange County cities. Could Los Angeles actually be a possible destination? They took the name already and with MLB's blessing, so I don't see why he wouldn't. Dan Haren tries to right the ship tonight. A tough chore, but baseball is a funny game. You never know. Let's Go Dodgers! Clap, Clap, Clap, Clap, Clap! 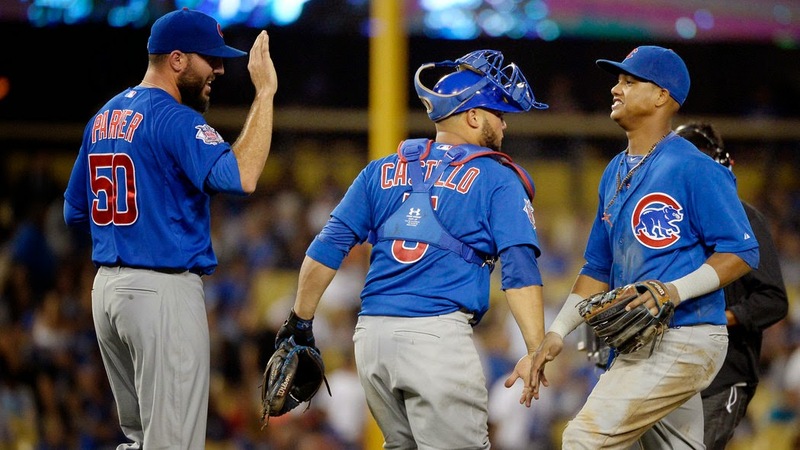 As much as we're all happy with the Dodgers place in the standings, some obvious weaknesses have been identified on the roster, and it took the lowly Chicago Cubs to expose that glaring hole in two spots of the starting rotation. Many of us identified it around the trade deadline. It is becoming quite a concern. The schedule gets even more difficult over the coming two weeks with the next 14 games against the Angels, Brewers and Braves. It's a rather difficult stretch and Ryu, Greinke and Kershaw can only pitch in nine of those contests. The Cubs celebrate Friday night's 8-2 win. The finished this three game set in Los Angeles winning two of three. So we should revisit the standings around August 17th and see where this team stands because the Giants have a number of games against sub .500 clubs during the same stretch. By no means am I saying that the Dodgers are in trouble, because I believe they can survive this August schedule and remain in first place, but a trade for a starter that gets through the waiver wire couldn't hurt. Where is this year's Ricky Nolasco to be had? After watching the lowly Cubs give the Dodgers a weekend battle that rivaled anything that contending teams would give them, the weaknesses of the #'s 4 and 5 starters were extremely exposed. These last place Cubs, a team the Dodgers had beaten 9 out of 10 contests coming in, and they came within an eyelash of sweeping the Dodgers this weekend. Such is life playing teams that are loose and have nothing to lose. The Cubs were definitely that. Taking chances and free swinging in spots that you normally wouldn't be if the pennant race stakes were high to them. It's tough playing these teams at times, and the Dodgers will face a lot of them in September, while take on NL West rivals that are all but eliminated by then, so they best get used to it. On the bright side today, Paco Rodriguez's performance was a welcome addition to the ball club. Going 2 innings and retiring everybody. He had great command and it leaves many of us begging the question why he hasn't been on the 25 man roster earlier when other relievers such as Maholm and Perez were really hurting the team. Rodriguez still has that deceptive delivery and out making stuff. Don't look at his Albuquerque stats, those are always misleading, which is why I say it's time to call up Zach Lee or Red Patterson and see what they can do in the rotation. Dan Haren may be hurt. I see no evidence to prove it, other than the reduction of his pitch velocity and lack of quality starts. Haren is pitching on an incentive laden contract that vests if he reaches 180 innings pitched. That's provides millions of reasons why Haren will continue to pitch hurt. Unfortunatley for Dan, it's time to sit down and figure out what's wrong. He hasn't had a decent start in almost two months. He has been given every ample opportunity to get things right, and it's not happening. It is complete speculation that Haren is hurt but there's no doubt that Beckett is. A hip issue keeps him from pitching between starts. He is in need of surgery, but he hangs on in an effort to give the club innings. Truth of the matter is that Beckett probably needs to sit too, and for the remainder of the season unfortunately. So while many were lauding Ned Colletti for not trading the top prospects at the deadline, the downside of that is the starting staff just might not have the horses to make it to the finish line. There's no Capuano and Fife in the wings to help this team make it through the dog days of summer. Heck there's not even a Jonathan Sanchez type at Albuquerque this year. There's no veteran presence that is mediocre to poor now that Maholm went down with injury, that can serve the team valuably by eating up innings. Magill and Frias can't do it. Chris Reed in Chattanooga isn't ready. Facts are facts. The organization is lacking in major league ready starting pitching. Now is the time that the trades of Allen Webster, Rubby DeLaRosa, Ethan Martin and Nathan Eovaldi have hurt. Trading away young arms can come back to bite hard, and it's happening now. The Dodgers had chances to win today. Base running gaffe's in the first inning cost them at least one run, maybe more. Stranding runners in scoring position is not something that is alien to this team, and the LOBs become magnified when # 4 or 5 of the rotation are pitching. This is truly a big problem that may come back to haunt this ball club. The Dodgers run Zack Greinke and Clayton Kershaw out there the next two days, and that means we might feel pretty good about them for two days, but then come the Haren and Beckett slots. Until this team figures out how to survive those rotation holes, the pennant race will be a white knuckle ride to the very end.